I know a lot about foretelling the future, without, unfortunately, I have to tell you, believing in it, which sometimes disappoints people…. I find it fascinating and I find it fun and I could read your cards for you now and I would hope we’d both find it amusing but I wouldn’t want either of us to walk away believing in it. Today let’s look at three interpretations of that card, from the historical to the occult and the standard understanding that young Rowling was most likely to have learned in the West Country as a young woman. After the jump! 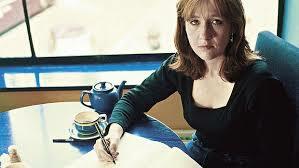 My guide for more than a decade in all things Medieval and supposedly Medieval has been Sandra Miesel. When I asked her questions about the tarot cards way back in 2007, she urged me to read A Wicked Pack of Cards: The Origins of the Ocult Tarot by Decker, Depaulis, and Dummett for the necessary historical background. I read it. To be as brief and clear as possible, the so-called twenty two Major Arcana cards were invented in Italy for a specific card game, something like Bridge without trumps, that was played with the four suits of playing cards very much like the ones we know today. They were not of ancient Egyptian origin but, at the earliest the fifteenth century; they have no connection with the Cabbalah per se except as invented by late eighteenth-century French charlatans and sophists; the images reflect commonplaces of the time rather than an alchemical sequence of transfiguation. ‘The Hanged Man’ was originally known as ‘The Traitor’ because being hung upside down by the foot was the fate and punishment of traitors from scoundrels of the Middle Ages to modern men such as Mussolini. Who is the hanged Man? What did he do? His feet are uppermost and his head is directed earthwards. This means, that his best elements serve the Earth, his attention is paid to the Earth. At the top there is only the fulcrum. Heis the messenger, from above to below, of the higher MENTAL to the LOWER physical plane. He bears in himself the end of the process connected with the involutionary triangle, as he sends a higher principle into Matter for the regeneration and subtilizing of that same matter. But his involutionary triangle is crowned with the cross of the Hermetic virtues, which showed him the way to that evolution, to that SACRIFICE. The number of twelve knots, being the symbol of the finite, again suggests the idea of the finite character of the evolutionary process: this means that the Absolute, the Unmanifested, is beyond forms and manifestation. 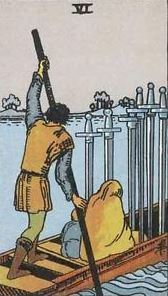 Modern occultists interpret this card as representing a sacrifice that is made willingly for the purpose of spiritual gain and this interpretation is not out of step with how the Hanged Man is originally presented [i.e., as a traitor]. 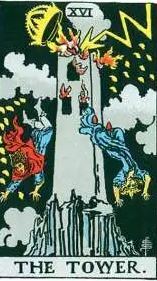 The Hanged Man is positioned after Hercules or a woman who symbolizes his heroic virtue. Several times in Greek mythology Hercules was found guilty of a crime and as a result was enslaved or pledged to complete a task as penance, thereby suffering an ordeal and a loss of position. The hero’s journey is not without pitfalls. Instead of rewarding Socrates for his wisdom, the Athenians declared him a traitor and forced him to drink hemlock. The crucifix is a reminder to every Christian that even Christ was executed as a traitor to the state. 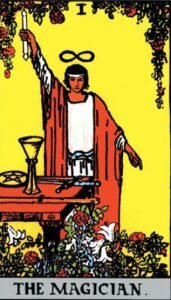 And, as we see, Death [Major Arcanum card XIII] follows the Traitor in the Tarot also (p 149; for a much, much longer Christian interpretation of The Hanged Man, see Meditations on the Tarot: A Journey into Christian Hermeticism. pp 304-337). 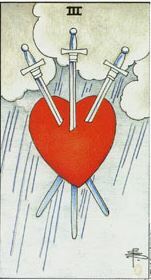 In readings, the Hanged Man bears the message of independence. 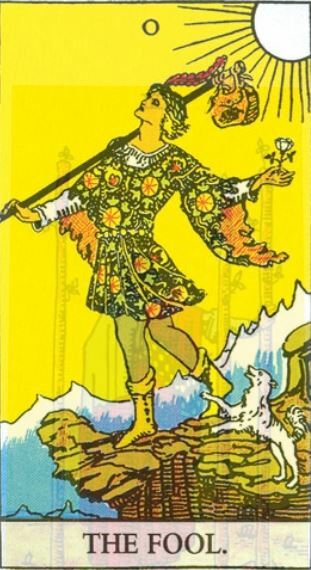 Like the Fool, which signified doing what you sensed was best, even if others thought it foolish, the Hanged Man indicates being who you are, even if others think you have everything backwards. It symbolizes the feeling of being deeply connected to life and can mean a peace that comes after some difficult trial. The trump reversed indicates an inability to get free of social pressure. Rather than listen to our inner selves we do what others expect or demand of us. Our awareness of life always remains second-hand, never a direct experience but only a series of stereotypes, like the person who models his or her behaviour on the orders of parents and the actions of movie stars (p 100). We’ll come back to this in the concluding post of this Hanged Man series when looking at what Rowling might have meant by the hanged men, women, and cat (!) in the Hogwarts Saga. I want to close this post with a look at the most probable source or reference for Rowling’s study in Wyedean and later, namely, the Rider-Waite tarot deck and A. E. Waite’s interpretations of same. Like it or not, odds are that the first tarot deck of cards an amateur reader stumbles on and uses is the so-called ‘Rider-Waite‘ deck. It was published originally in 1909 by the Rider Trading Card company and it features seventy eight cards, twenty-two Major Arcanum, fifty-six Minor Arcanum (four suits of fourteen cards each), all with illustrations by Pamela Coleman Smith and drawn from the instructions of A. E. Waite. 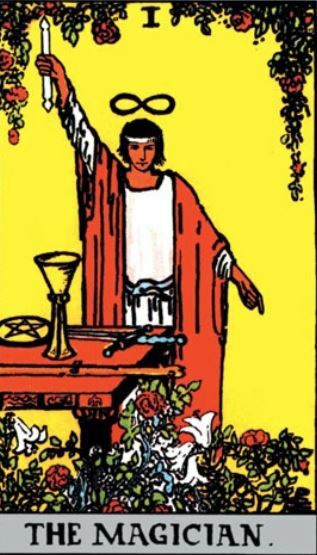 This deck remains the most popular currently in use and its images are the prevalent standard for readings and interpretations (all illustrations for this post are Rider Waite images). It comes with a small pamphlet with interpretations for each card. This pamphlet and Waite’s Pictorial Key to the Tarot were more likely than not Rowling’s first references in her study of the Tarot as a Comprehensice School student, and, as such, deserve a look for their exegesis of The Hanged Man card. 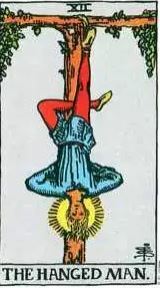 12: THE HANGED MAN — Wisdom, trials circumspection, discernment, sacrificice, divination, prophecy. Reversed: Selfishness, the crowd, body politic. The gallows from which he is suspended forms a Tau cross, while the figure – from the position of the legs – forms afylfot cross. There is a nimbus about the head of the seeming martyr. It should be noted (1) that the tree of sacrifice is living wood, with leaves thereon; (2) that the face expresses deep entrancement, not suffering; (3) that the figure, as a whole, suggests life in suspension, but life and not death. It is a card of profound significance, but all the significance is veiled. One of his editors suggests thatEliphas Levidid not know the meaning, which is unquestionable – nor did the editor himself. It has been called falsely a card of martyrdom, a card of prudence, a card of the Great Work, a card of duty; but we may exhaust all published interpretations and find only vanity. I will say very simply on my part that it expresses the relation, in one of its aspects, between the Divine and the Universe. In the concluding post of this series, I’ll take a stab at guessing what Rowling meant in her use of hanged man imagery built on these ideas of The Traitor, of the occult interpretations, and on the prevalent Waite theories. More anon!